We Set Up A Demo Account For You To Test! Grab your phone, open up your texting program, and send the word DEMO to 619-333-2571. If you got it, but still don’t see the potential or can’t see how it can benefit your business, here’s one practical example you’ll be able to understand right away. Wouldn’t YOU send the code to get that 20% discount instantly? Of course you would! And even if you wouldn’t, fact is that in a recent survey, 73% of smartphone users said that they WANT to receive coupons and special offers directly to their phones. Are YOU taking advantage of that? 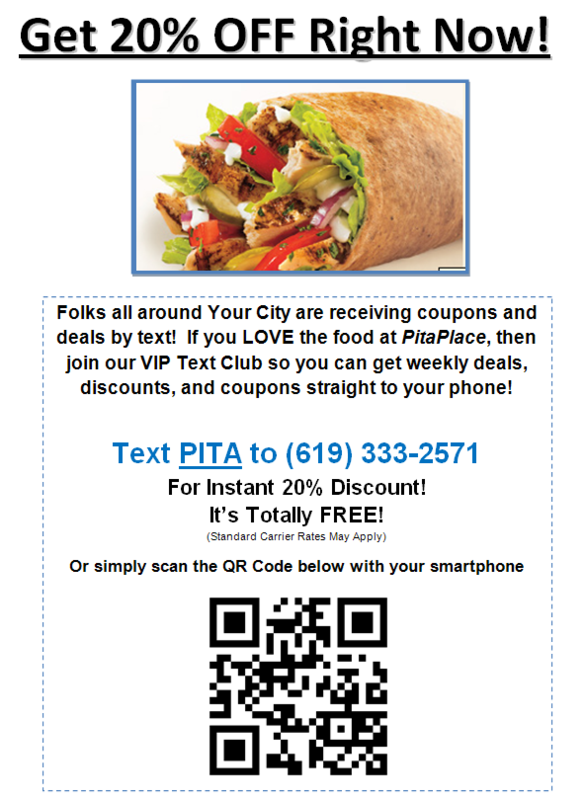 By the way, go ahead and send the word PITA to the number on the flyer above and see what happens. Don’t worry, it’s only a demo account so you can understand how to use SMS for your business. If you’ve been in business for any amount of time, you know that the most expensive customer to get is the first one. But what are you doing to market to that customer over and over to get them to keep coming back to you? If you’re relying on them coming back to you based on giving them excellent service and a great product, then keep in mind that you’ll end up with the 80/20 rule. That’s right, 80% of your business comes from 20% of the customers you meet. It’s a harsh reality, but no matter how hard you try, you’ll only be able to get 20% of those customers to come back again. The rest will forget you even exist. Which is why you need to continue to spend money on advertising day after day, month after month. When you have SMS Text marketing in your arsenal, then you really tip the balance in you favor. You see, with SMS text marketing, you can send promotional text messages to your subscribers any time you wish. And at a cost of only 4.5 cents per message, your message can go out very cheaply. You can easily boost your sales for that day and for any day you send out a promo! Visit the Pricing Page to see how easy it is to sign up right now, or give us a call so we can help answer any question over the phone. We look forward to helping you succeed with your Mobile Marketing campaigns.